Imam Shahin Hasanli speaks at one of Menevi Saflig Devet’s seminars (MSDIB). When I was in Baku in the fall of 2012 I attended a ceremony to commemorate Ghadir Qum. Named after a hamlet where the Prophet Muhammad reportedly halted on his way back to Medina from his last pilgrimage to Mecca, the event commemorates the alleged appointment by the Prophet of his young son-in-law and faithful companion, Ali, as his heir and successor in front of a crowd of the faithful. The ‘Ghadir Qum Speech’ reportedly took place in the spring of 632, some three months before the Prophet passed away. Ali’s appointment was disputed, and eventually he was only to become caliph, or successor of the Prophet as the leader of the faithful, some 25 years later, as the last of the Prophet’s original companions to hold this post. Ali is considered to be one of the main imams or community leaders among the Shi’ites, who especially commemorate the event and who form the denomination to which a majority of Azerbaijan’s Muslims adhere or at least traditionally associate themselves with. The commemoration was organized by and took place in the clean and sober premises of an Azerbaijani association called Menevi Saflig Devet Ictimai Birliyi (Social Union for the Appeal to Moral Purity). 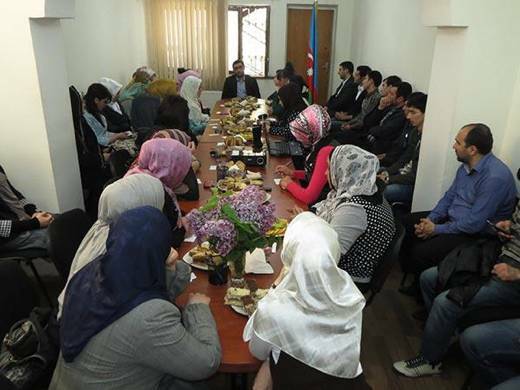 Some forty people – slightly more women than men – were listening to a young guest speaker from Baku’s Islamic University who, regularly quoting from a pocket Quran and some handwritten notes, explained the background and social significance of Ghadir Qum. You can read the full text of this 10 page long article below or click here for downloading the PDF file (828 Ko).